Paulette Blagburn spends her workdays at the R&D bench, solving cable design problems and creating new products. Karen Credit manages Purchasing, Planning and Inventory Control. Kathy Beaudoin leads the Sales team in landing new accounts and closing deals in a highly competitive market. These three are parts of a group of women playing key roles at Comtran Cable. 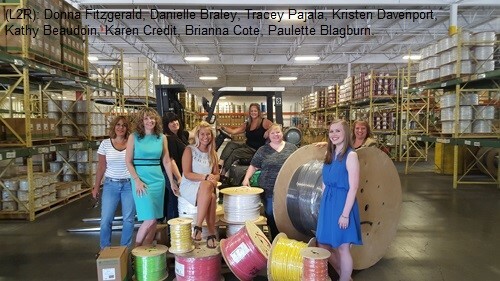 Their presence in the largely male-dominated cable world is a part of a ‘dream team’ credited with Comtran’s ongoing growth and success. The women in Sales, Marketing, Engineering and Materials represent 42% of the non-manufacturing staff at Comtran. This is well above average for wholesale and manufacturing industries. According to the U.S. Bureau of Labor Statistics, in 2015 women comprised about 14% of Engineering, 26% of Sales, and 44% of Purchasing in similar occupations. The good news is these national numbers are significantly higher than 20 years ago. Comtran executives didn’t set out to hire women, but they are seeing the positive impact of those decisions. “In every case we hired the most qualified person. As luck would have it, we ended up with our own dream team of talented women… and the company is doing better than ever,” says Joe Barry, Comtran’s General Manager. The career paths of these women are as varied as their jobs. Some are just starting out in their careers. Others are 20-year veterans of wire and cable. “I was entrepreneurial from the time I could count change and work my grandparent’s vegetable stand. I started at Draka working for the VP of Engineering 20 years ago and rose up through the ranks. I was fortunate to have some amazing mentors along the way,” says Danielle Braley, Midwest Regional Sales Manager. Being the only woman at the table can have its challenges, but times are changing. More and more, women are considered equals. Paulette Blagburn, Product Design Engineer, has been at Comtran for one year. She works primarily on new and existing Fire Resistive and Rail Transit specialty cable products. She acknowledges that when she was in high school, girls weren’t encouraged to go into STEM (Science, Technology, Engineering, Mathematics) careers the way they are today. Other women on Comtran’s team include Kristen Davenport, Inside Sales Account Manager and Brianna Cote, Marketing Coordinator. Davenport’s clients benefit from her degrees in Economics and Marketing, which help her position and market Comtran products to meet current economics of the cable industry. Cote joined Comtran 3 ½ years ago after earning her Marketing degree. As a millennial, she is fluent in Social Media and Digital Marketing, which have helped Comtran gain industry exposure and qualified leads.